Hello. Sorry for disturbing you but my brothers and I can no longer stand idly by whilst this once proud country goes to the dogs, all thanks to our useless Government, Brussels and political correctness gone mad. 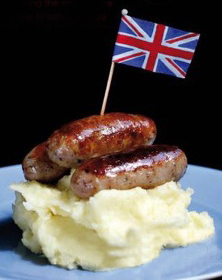 I am of course talking about sausages, otherwise known as the Great British banger. This vital part of an Englishman’s everyday diet, the English sausage is now under attack from European bureaucracy and spineless Governments. After much red tape making across the channel by self-appointed, BMW driving, white wine drinking, pasta eating, food safety officials we have been instructed that our “As English as hayfever” sausages MUST now be made with at least a 40% imported meat content. Our hand-made sausages don’t even have 25% meat in them, so I don’t know how they reckon that will work. And due to last year’s “media scare” we’re no longer allowed to make them from horses. Or donkeys. This is just crazy. We are a traditional British butchers and have been proud to make meat-stuffs from Grand National winners and beach-walking asses for over 150 years. So please join us in standing up for a great traditional meal, stand up for Britishness, stand up for the Queen, and let’s give Johnny MEP a black eye. 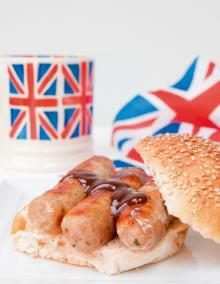 Vote UKIP next week and sign the petition in our shop to Save Our British Sausage (SOBS). David, Tony and Shawn Bradford. Bradford’s the Butchers. UKIP Supporters.